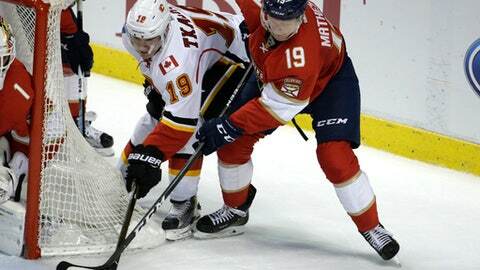 SUNRISE, Fla. (AP) The Calgary Flames are having a successful road trip, while the Florida Panthers are struggling at home. Chad Johnson made 36 saves during his first start in five games to lead the Flames past the Panthers 4-2 on Friday night for their third consecutive victory and fourth in five games. Sam Bennett, Mikael Backlund, Deryk Engelland and Troy Brouwer had the goals for the Flames, who scored three straight in less than five minutes midway through the first period. The Flames have earned seven of a possible eight points in their last four games, all on the road. Aleksander Barkov and Nick Bjugstad scored for the Panthers. Roberto Luongo stopped 24 shots in his first start in three games. The Panthers, coming off the first five-game road sweep in franchise history, have lost two in a row overall and their past three home games. They play two more at home before they go back on the road. Calgary stretched its lead to 3-1 when Engelland swept in a loose puck in the crease with 6:09 left in the first. Florida closed to 3-2 on Barkov’s shot from the point with 2:40 remaining in the period. Barkov has seven goals in his past eight games. Brouwer made it 4-2 at 6:19 of the second when he redirected a pass from Matt Stajan into the net from in front. Bjugstad gave the Panthers a 1-0 lead on his power-play goal at 5:45 of the first when his shot from the left circle went off Johnson’s blocker and in. The Flames tied it when Bennett grabbed a rebound in front and poked it in at 8:57. Calgary took a 2-1 lead 79 seconds later when Backlund scored on a wrist shot from in front. NOTES: Luongo passed Ed Belfour for fourth place on the NHL’s list of games played by a goalie with 964. … Flames forward Kris Versteeg played his 600th NHL game. … RW Alex Chiasson played his 300th career game. Flames: At the Carolina Hurricanes on Sunday.